"New York Times" Bestseller "Masterly crafted" "The Wall Street Journal"
For readers of"Between Shades of Gray"and" All the Light We Cannot See," bestselling author Ruta Sepetysreturns to WWII in this epic novel thatshines a light on one of the war's most devastating yet unknown tragedies. Just when it seems freedom is within their grasp, tragedy strikes. Notcountry, nor culture, nor status matter as all ten thousand people adults and children alike aboard must fight for the same thing: survival. Told in alternating points of view and perfect for fans of Anthony Doerr's Pulitzer Prize-winning"All the Light We Cannot See," Erik Larson's"Dead Wake," and Elizabeth Wein's Printz Honor Book"Code Name Verity," this masterful work of historical fiction is inspired by the real-life tragedy that was the sinking of the"Wilhelm Gustloff "the greatest maritime disaster in history. As she did in"Between Shades of Gray," Ruta Sepetys unearths a shockingly little-known casualty of a gruesome war, and proves that humanity and love can prevail, even in the darkest of hours. Praise for"Salt to the Sea"
Featured on NPR's Morning Edition Superlative masterfully crafted a] powerful work of historical fiction. 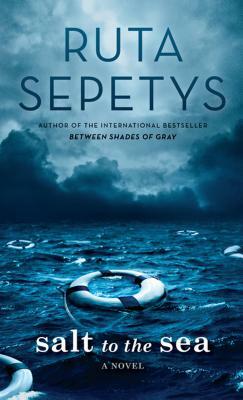 "The Wall Street Journal " Sepetys is] a master of YA fiction she once again anchors a panoramic view of epic tragedy in perspectives that feel deeply textured and immediate. "Entertainment Weekly ""Riveting...powerful...haunting." "The Washington Post " Compelling for both adult and teenage readers. "New York Times Book Review " Intimate, extraordinary, artfully crafted brilliant. "Shelf Awareness" "Historical fiction at its very, very best." "The Globe and Mail" "" H]aunting, heartbreaking, hopeful and altogether gorgeous one of the best young-adult novels to appear in a very long time. "Salt Lake Tribune *""This haunting gem of a novel begs to be remembered." "Booklist" *"Artfully told and sensitively crafted...will leave readers weeping." "School Library Journal"
Praise for "Between Shades of Gray"
A" New York Times"Notable Book A"Wall Street Journal"Best Children's Book A"Publishers Weekly," "School Library Journal," "" Booklist"," and"" Kirkus""Best Book iTunes 2011 Rewind Best Teen Novel A Carnegie Medal andWilliam C. Morris Finalist A"New York Times"and InternationalBestseller Few books are beautifully written, fewer still are important; this novel is both. "The Washington Post "*" A]n important book that deserves the widest possible readership. "Booklist. Ruta Sepetys (www.rutasepetys.com) was born and raised in Michigan in a family of artists, readers, and music lovers. She is the award-winning, bestselling author of "Between Shades of Gray" and "Out of the Easy." Ruta lives with her family in Nashville, Tennessee. Follow her on Twitter at @RutaSepetys.